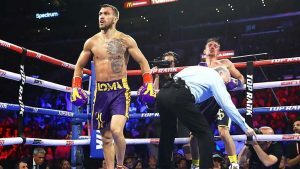 Vasyl Lomachenko vs Anthony Crolla Results –Vasyl Lomachenko retains his WBA/WBO & ‘Ring’ magazine lightweight titles with a dominant fourth round knockout of Anthony Crolla in Los Angeles. Vasiliy Lomachenko once again staked his claim as the pound-for-pound king, knocking out mandatory challenger Anthony Crolla in four rounds to retain his WBA/WBO/Ring Magazine lightweight titles. Crolla, the former WBA lightweight champion, was game but never threatened Lomachenko. After tough battles against Jorge Linares and Jose Pedraza in 2018, he had an easier night at the office to begin his 2019 campaign. Lomachenko (13-1, 10 KOs) scored a knockdown at the end of the third round when referee Pat Russell ruled the ropes held Crolla up. In the fourth, Loma came out on the attack, knocking Crolla (34-7-3, 13 KOs) back to the ropes. Then, it happened. A right hook to the top of Crolla’s head put him down and out.